(1 Customer Reviews) | Write Review 26 issues per year Gamer Interactive delivers next generation games coverage across all formats. Whether you're at home on a PC, handheld, mobile or console, Gamer Interactive unites us all. Your one-stop shop for all things related to gaming, the app offers content just as in-depth as you’d find in a print magazine but boasting fully interactive videos, animated pages, audio interviews, screenshot galleries, digital media integration and – most important of all – 100% independent opinion from videogame veterans, all delivered as fast as a speeding broadband bullet. FREE to download! We've got two of the biggest games of 2014 in our sights, with a first look at Call of Duty: Advanced Warfare and an in-depth feature on Bungie's epic sci-fi shooter, Destiny. And if racers are more your thing how about comparing the ambitious Project CARS against the nickel-slick GRID Autosport? There's all this and more inside another packed issue, ranging from Mario Golf: World Tour to Wasteland 2, the latest RPG from the brainchild behind Fallout. And Wolfenstein, because you can't go wrong with a bit of Wolfenstein. If you're into gaming, we've got you covered. Gamer Interactive delivers next generation games coverage across all formats. Whether you're at home on a PC, handheld, mobile or console, Gamer Interactive unites us all. You'll receive 26 issues during a 1 year Gamer Interactive magazine subscription. This has got to be the best Xbox One mag ever. Fully interactive and cant believe the price!! 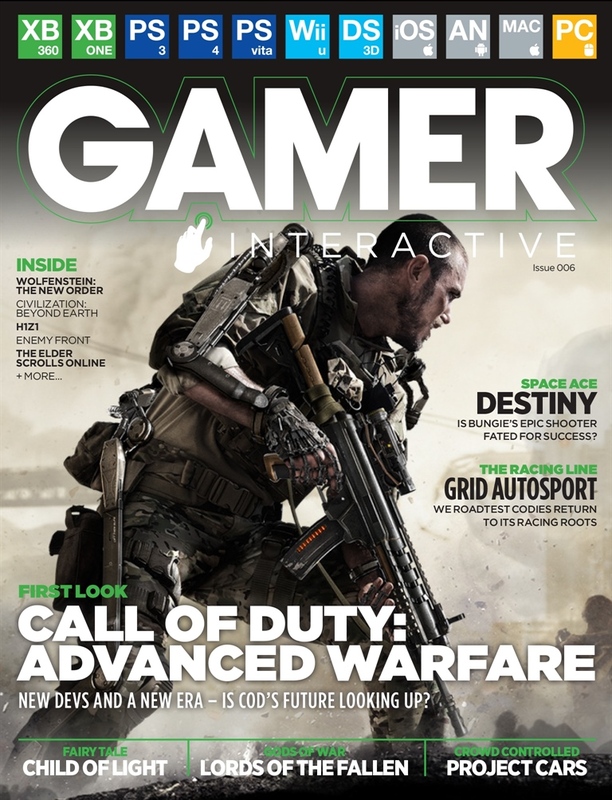 You'll receive 26 issues during a 1 year Gamer Interactive magazine print subscription.